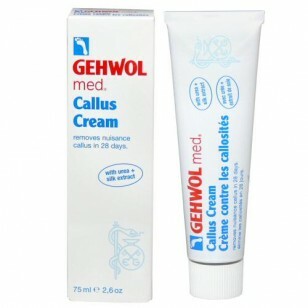 GEHWOL med Callus Cream removes stubborn calluses within 28 days. Urea, fortified with glycerin and allantoin, loosens the cell bonds of hard callus layers. This intensive care formula immediately softens and noticeably starts to reduce calluses within days of application. Normal skin conditions are generally attained within 28 days. Lipids strengthen and protect; silk extract provides moisture and smoothes skin. Effective ingredients: Avocado oil, sea buckthorn oil, urea, glycerin, algae extract, allantoin, farnesol. Directions: Apply cream to affected areas twice daily. Do not apply to sensitive or broken skin. Do not bring into contact with eyes and mucous membranes. Regular skin care with GEHWOL med Lipidro is recommended to protect against the formation of new calluses.